Just posted an update to my "Modern Cards" skin for JRiver Media Center. 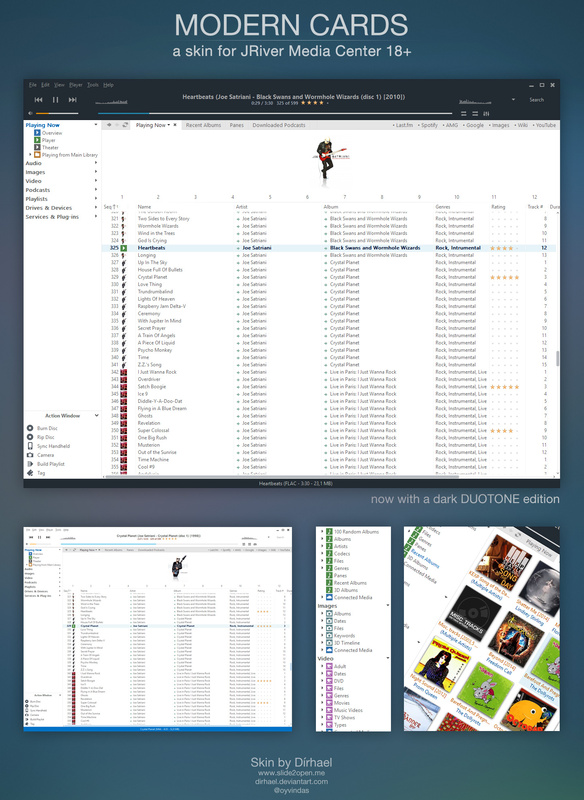 This new version comes with a duo-toned edition, with a dark player- and bottombar. It also contains various tweaks for the scrollbar handles (in both versions of the skin), playerbar icons, the splitview tabs and more. NOTE: I'm still working on the skin, so if you find and problems or bugs please report them to me. You can download a copy of the skin over at my DeviantArt page. Installation is quite simple. Just download and unzip the content of the archive to your JRMC folder. By default this folder can be located in "C:\Program Files (x86)\J River". If you don't want the custom icons, you can skip copying the "data" folder. Installing the skin will not overwrite any stock JRMC files.